KONG AirDog Squeakair Ball With Rope is a handy fetching ball with a launching rope for playing with your dog. This combination of two classic dog toys is entertaining for dogs and easy for owners to use. 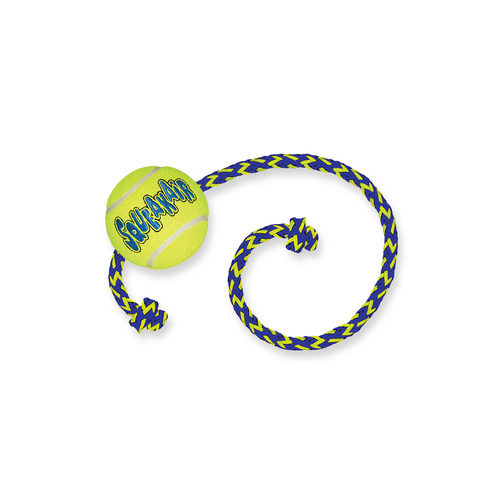 This AirDog Squeakair Ball contains a high quality rope that allows you to throw further and is easy to pick up. The fetching toy guarantees hours of fun. The squeaker in the AirDog Ball challenges your dog to play for longer. In addition, the toy has a non-chafing tennis material, which cannot cause any damage to your dog's teeth. Have you used KONG AirDog Squeakair Ball With Rope before? Let us know what you think about this product.